Sometimes we go out of our way to find Taste Test items and sometimes they just fall in our laps. The fine, comically mustached people over at Pringles were kind enough to send us two of their new flavors, both of which are available exclusively at Walmart. 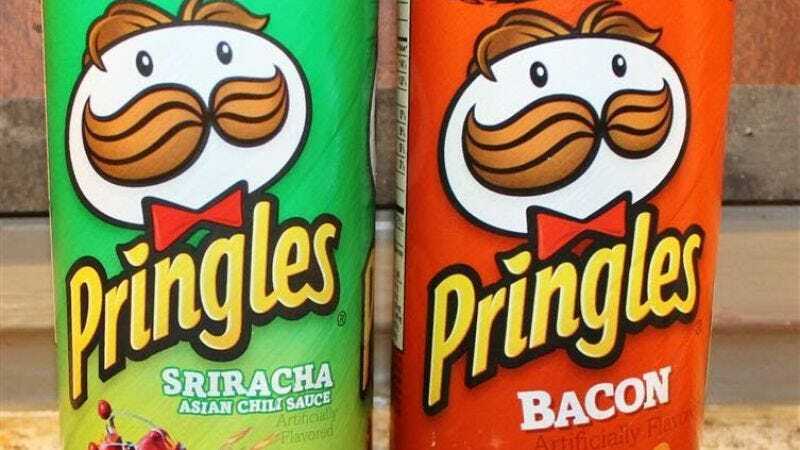 Pringles Sriracha Asian Chili Sauce promised a dragon’s worth of spice, while Pringles Bacon Potato Crisps advertised, well, the existence of bacon—or at least bacon flavor—within the “potato crisps.” Spurned on by the existence of these chips in our office and our intense, salty hunger, The A.V. Club staff decided to eschew our more elaborate, edited, and labor-intensive Taste Test format for these little buggers, instead choosing to go the quick and dirty route with an Instagram Taste Test. We also threw in some Walker’s Smoky Bacon Crisps Editorial Manager Laura M. Browning brought back from England, just as a sort of bacon-centric control. Our knee-jerk reactions are below, as is a video of dapper Associate Editor Erik Adams shoving as many Sriracha Pringles in his mouth at one time as humanly possible.